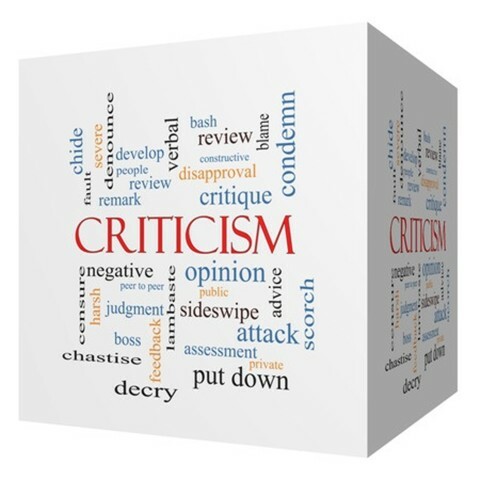 Criticism is defined as “the act of criticizing usually unfavorably.” (merriam-webster.com) I think this definition is one of the better ones. Most of the time criticism is a negative thing but constructive criticism can be a positive outlet to build someone up while still helping them through some flaws, mistakes or weaknesses they may have. Whether you criticize in a negative or positive way, the main thing to remember is that YOU have the choice to decide how you will criticize. What does the Bible say about criticism? Let’s take a look! Constructive criticism will only work on someone who wants to become wise and learn. To the fool this will only make him lash out more, mostly because of his own insecurity that you are right. Fools love to make you feel dumb, and they hate it when others make them look dumb. This is the key. A fool thinks you make them look dumb when you correct them. A wise person thinks that you are right and therefore will increase in learning and become a little bit wiser because of it. So, this takes some discretion on your part. You need to be wise and know if it is even worth it. I have 2 people in my mind right now: a fool and a wise man. I know these 2 people and I know how each one will react when I correct them. This is how you must approach this decision. You need to know in advance how someone will react to you. A fool will not care what you have to say. Don’t waste your breath on them. Still love them and be kind but don’t bother with correction. Criticism is all about attitude. Well, God is very critical of us because we have an issue called sin, which His own Son, Jesus, died for. Sin is no joke to God and He will be critical of us. In the book of Job you will see a conversation take place between Job and three of his so-called “friends”. The whole dialogue in a general sense consists of the friends berating Job and Job defending himself while complaining and wishing he was dead. Near the end God steps in with a lengthy discourse on how unworthy and unwise they all are. He starts it off by saying, “Who is this that darkens My counsel by words without knowledge? Dress for action like a man; I will question you, and you make it known to Me.” (Job 38:2-3) God’s whole discourse criticizes the men’s own intellect and power which is pitiful in the presence of God. God is a God of love and of wrath. He is a jealous God and He will criticize every single sin you’ve made if you die without accepting Jesus. He will be your judge at your last breath! However, God will gladly give us wisdom and critique us in a positive way if we will only listen. God’s reproof leads to life, but only the wise man will hear it and obey. And the wisest decision you will ever make while you are alive is choosing to obey God and accept Jesus as your Savior for the remission of your sins. Criticism is all about attitude. You can criticize others to make yourself feel good and make them look dumb. Or, you can constructively criticize others and help them become better people and wiser at the same time. You have to want to help others if you are going to critique them in a positive way. So, make the choice today! Be positive! And if you are still wandering through life without a Savior, please consider Jesus today! You will become blameless in the eyes of God the moment you choose Jesus. May God bless you as you continue to live a life worthy of the calling! Take a look at this article also by Derek Hill: What Does the Bible Say About Expectations? Not to be too critical Derek…but I disagree with your criticism of the use of criticism….lol. I think your definition is a common one, where the implication is that the judgment being made is not only “unfavorable” but “unfair”. If it was to be defined as such I would agree wholeheartedly with you. Likewise we are not to have a critical spirit finding fault for fault’s sake, again this speaks to the idea of “unfairness”. That is an incorrect definition of criticism though. “Any kind of negative criticism is unnecessary and foolish”. “Negative criticism means voicing an objection to something, only with the purpose of showing that it is wrong, false, mistaken, nonsensical, objectionable, or disreputable. Generally, it suggests disapproval of something, or disagreement with something – it emphasizes the downsides of something…. The upside of negative criticism is that it can explain what the limitations of an idea, an action or a situation are, for the sake of being realistic. Sometimes it is necessary to say “no” to something (and explain why “no” is “no”). This sounds like the Church in America today, doesn’t it? Where are the cries from the pulpit against gay marriage, against abortion, against Congress and their marginalization of the Christian’s voice in America?? Where are our cries?…Our criticism of this outrage!! The Church(we) have been silenced. Are we supposed to be the meek puppies in the corner not raising a fuss(Alarm)? No ,we are to be like Christ with the money-changers. Where are the Christian martyrs in America? We are too busy being meek and mild as these unborn babies are aborted(50 million, just in our country over the past 41 years). That is a whole generation of Americans…gone…and we remain silent, marginalized….non-critical…..weak…..pathetic…lukewarm…ready to be spewed from His mouth…. I do appreciate your articles and wish you God’s Blessings! Hi DocReits. I used the definition I chose on purpose with the words “usually unfavorably” which opened up the door for constructive (positive) criticism. Maybe you are being too critical of me haha! Of course the church should always speak against any evils that you mentioned: “against gay marriage, against abortion, against Congress and their marginalization of the Christian’s voice in America.” There are people doing this but we definitely need more, in fact we need every single person who truly believes in Jesus to stand up for what is right in every single circumstance. Thank you for your thoughts. God bless! Interesting article Derek. I have been counseling a man from my old church who only hears what he wants to hear and blames everybody, except himself for his failures. All he thinks about is how we can help financially while he expects his partner to pay for everything. Neither of them are working and it is her family that has to come up with the means to exist. They have a small baby, his partner is an alcoholic and he uses that as an excuse not to work. As he is 53, you would have thought he should be old enough to know better. . There are a number of us who lovingly and prayerfully have tried to help him. Sadly all of us have had to walk away. We still pray for him daily though. Sorry to unburden myself like this, but it has been getting all of us pretty down who have tried to help him. I empathize with your dilemma regarding this man who wants more money from the Church to keep himself going. You took me back about 15 years when I was in the middle of a similar circumstance. This man, about the same age as your speaking about(53), had four children whom he was homeschooling. He was out of work and asking for help from the church. The church had given him some assistance and then had stopped and that is when he approached me to carry on the work of his support. I did, for a time, supplying his children with all of the books they needed for their schooling, etc. I was up into the thousands of dollars and he was still pleading for additional funds for fares to see his dying father, etc. I felt terrible for his situation and yet I knew I had fallen into this hole into which there was no way out, since I had become his financial source. I counseled with the church and they advised me to stop immediately. There thought was that the Church(including myself) was robbing from God’s work by supplying the continual needs of this individual. I still had problems with that as the man was looking for work(he said) and he seemed to have legitimate needs. I prayed and prayed over this situation with no clear word from the Lord. Oh, I knew the Scripture but it was still difficult to stop funding this man, which I eventually did(stop). He did find work, I believe, and I lost track of him after that. “Don’t you remember the rule we had when we lived with you? “If you don’t work, you don’t eat.” And now we’re getting reports that a bunch of lazy good-for-nothings are taking advantage of you. This must not be tolerated. We command them to get to work immediately—no excuses, no arguments—and earn their own keep. Friends, don’t slack off in doing your duty.”(The Message, 2 Thes 3:10-13). Tough love! I will pray for your situation…. Greetings Doc, many thanks. I know 2 Thes 3, but not the Message Bible version which puts it very nicely indeed. When we do support him financially, he goes out drinking before he even puts groceries on the table then phones me up in an incoherent state and starts verbally abusing me with crackpot ideas, sometimes at 5.30 a.m. The result is neither the elder nor myself will support him anymore, I even refuse to go to his flat because the atmosphere there is so so so bad. That said, I still lift him and his partner in prayer, as do others. Again, many thanks Doc for your prayers. May our Lord and Saviour Jesus Christ Who died for us and rose again richly bless you. Hi David. You can only do so much for someone. If they choose to continually make excuses for themselves instead of choosing to do things God’s way then I think you are right. Sometimes it is appropriate to walk away. I know I have before, so keep on doing what you are doing. Keep praying always. You never know what will happen! God bless you! Blessings Derek, many thanks for your words of encouragement. Yes, I still believe God does miracles, so does our elder who has the gift of healing, We pray that his partner will be healed of her alcoholism, and he from resentment and self pity. Thank you very much for your Gid-sent article on criticism : it certainly blessed me and if it’s OK with you, I will use it in teaching the congregation. Yes, I have written some points on criticism but you put all points very well. God bless you and your ministry. Theodora. There was a conservation that took place about a young lady that was disappointed in something that happen to her, and she posted a comment about it and use the words “immature personality” she was very disappoint in this person and she used this to describe the character of that person. Well some one replied that was not appropriate for her to call some one immature from a Women of God because she walks with the Lord and this can not be tolerated. I would like your option on the person that made the comment. Because now she is being convicted on what she said believe me I was with the young lady when the disappointed happened and she was very crushed and cried so very badly. Hello Natalie. How can someone know whether a person is an immature Christian or not? I would say the person that says such a thing is the one who is more immature because Christian’s don’t label people or call them names. This is not what the Bible teaches. I pray that the person who said such a thing repents and asks for the person who they offended to forgive them. That’s the Christian thing to do (Matt 18:15-18). Besides, it only matters what God thinks about them and not what any person says.